I think the word ‘singular’ most aptly describes this novel – quite simply I have never read anything quite like it, and found myself irritated, bored, amazed and moved – and I also laughed my head off. It’s a maddening piece of work that I started out hating and ended up in love with. Creative writing students are taught that their opening paragraphs must intrigue; that exposition must be neatly, almost invisibly, smuggled in; that they must pay attention to point of view and not go wandering off anywhere they feel like; that they should create rounded, believable, sympathetic characters; that they shouldn’t bewilder the reader by introducing too many characters at once; that they should show rather than tell; that they must give their work a satisfying and explicable structure and be sure it has a plot with sufficient narrative momentum. 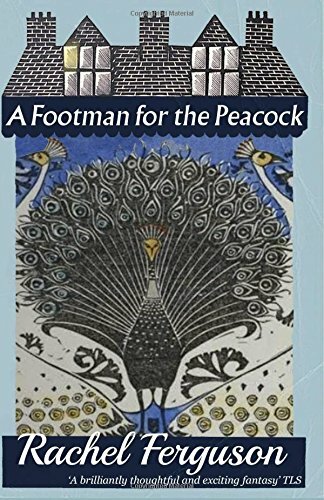 None of the above applies to A Footman for the Peacock. scratched on the window of a servants room. This constitutes a mystery, which very gradually and obliquely is picked at and finally unravelled. Change and time are central themes in this book. The house itself is significantly named Delaye and the family the Roundelays. With the approach of war there’s a real sense not only of the danger to come but also of the past existing below the fragile present, pushing its fin up like a shark. While shopping in Norminster Lady Roundelay pauses ‘to stare like a tripper at some antick goblin carved in wood grey’d by the weather and winds of six centuries and keeping still its blurred, derisive grin above the windows of a wireless shop.’ The thickened sense of time here allows for a story where ripples of ghostliness, instances of telepathy, and more than a suggestion of reincarnation feel natural rather than contrived. 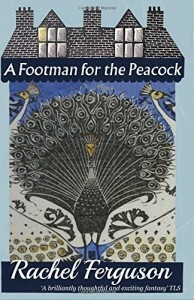 The narrator is omniscient yet, peculiarly, the narrative wanders like a stream of consciousness, digressing into subjects as diverse as the BBC’s attempted coverage of a nearby village; the villagers’ idiosyncratic dialect; the researches of one family member into WW1 and many unexpected dips into pockets of back-story. It’s a detached and enjoyably malicious viewpoint, shifting restlessly so that even once the exposition is over and we begin to settle with the characters in the now of the story, it’s hard to decide who is central, whom we should care about; indeed it’s not until towards the end or that it becomes clear that it’s Angela, the fey younger daughter of the house, Sue Privett, a maid, and the peacock that struts the grounds, terrorizes the family and seems – on a moonlit night – to be deliberately signalling to German bombers, who are at the heart of it. The characters are not rounded in the conventional sense but they are all vividly individual and quaintly foibled. Though the narrator’s attitude towards them all is almost consistently detached, or verging on spiteful, I found myself ultimately very moved. If a measure of good fiction is that it takes one to a new place and sends one back changed by the experience, then this is good fiction, even if it breaks every ‘rule’ I know. There’s an angry social current running through this bitter comedy; a great deal is made of the plight of ‘women who fail to find a husband to rescue them from a life of good deeds’, described by Lady Roundelay as ‘pathetic social tragedies of unwantedness’. And when the war begins the selfish and lacklustre way the wealthily insulated family reacts, refusing to take in their quota evacuees, bemoaning the way war will send up the price of feed and mocking the efforts of the villagers to prepare for it, is viciously satirized – though there are some very funny scenes, the way the elderly Nursie stumbles downstairs in confusion and accidentally frees them from the obligation to take in children: ‘I hadn’t been informed there was a mental case here,’ Mr Mallet the poor billeting officer says. Of Mr Mallet we learn, ‘He had had an appalling day … He had helplessly placed a girl of nine in the care of a hard-faced woman who admitted she hated all children: had put, willy-nilly, two more into an unventilated cottage where the elder would have to share bed with an asthmatic of seventy-two, …his own underclothes felt prophetically acrawl.’ It would be difficult not to detect real fury beneath the satire. I finished this novel feeling as if I’d been on a trip with a maddening, principled, hilarious, deeply potty and very lovable great-aunt. And as soon as I’d finished I wanted to begin again.